Honda has made it official and released a fix to the Pioneer 1000 clutch slippage that some of you might have read about on the forums as a potential problem with the Pioneer 1000 and 1000-5 models. 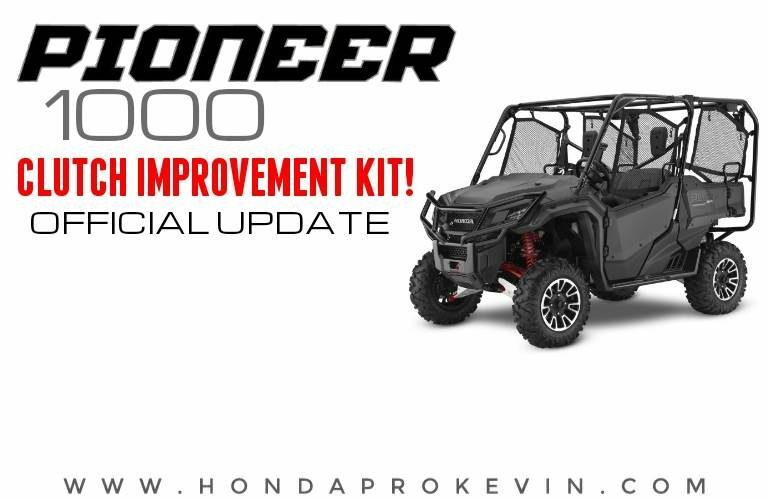 Honda has finally decided to tackle this head-on to put current Pioneer 1000 owners as well as possible future owners minds at ease. * 2018 Honda Pioneer 1000 / 1000-5 models are not included as they already have the latest “fix”. This Product Improvement Campaign ends the September 30, 2020. The Honda Pioneer 1000 model you are considering for purchase is affected by a Product Improvement Campaign to reinforce the proper driving techniques outlined in the vehicle Owner’s Manual – Driving Guidelines and to improve the durability of the No. 1 clutch assembly on affected vehicles. Under driving conditions where the No. 1 clutch operates within the slip/engagement zone for prolonged periods, the No. 1 clutch may overheat, leading to accelerated wear of the No. 1 clutch components. Conditions such as towing with the sub-transmission in high-range, or operating your vehicle for extended periods in the clutch slip/engagement zone, can overheat and damage the No. 1 clutch. By observing the driving guidelines outlined in the vehicle Owner’s Manual, drivers can avoid overheating the No. 1 clutch. A Clutch Improvement Kit is available which allows the No. 1 clutch to operate at a lower temperature, potentially preventing clutch damage under the conditions described above. Potential No. 1 clutch overheating and damage will affect only a small percentage of the total eligible vehicles. Even without the Clutch Improvement Kit, most customers will have excellent vehicle performance if they observe the driving guidelines outlined in the vehicle Owner’s Manual. If you plan to use this vehicle for towing, hill climbing, or low-speed technical driving, the Clutch Improvement Kit can be applied to your vehicle before delivery, at any time within the Honda Limited Warranty period, or within the improvement campaign period, whichever comes later. Parts Availability: Initially, the Clutch Improvement Kit parts supply will be limited. Please consult with your Honda dealer for the latest kit availability. Driving Guidelines: To ensure that your Pioneer 1000 continues to deliver excellent performance, please review the Driving Guidelines information on the reverse side of this notice. The customer is then required to sign this form. American Honda Motor Co., Inc. is conducting a Product Improvement Campaign to reinforce the proper driving techniques outlined in the vehicle Owner’s Manual – Driving Guidelines, and to improve the durability of the No. 1 clutch assembly on all model year 2016 and 2017 SXS1000 series vehicles. Our records indicate that you own a vehicle that is eligible for product improvement. Under driving conditions where the No. 1 clutch operates within the slip/engagement zone for prolonged periods, the No. 1 clutch may overheat, leading to accelerated wear of the No. 1 clutch components. Conditions such as towing with the sub-transmission in high-range, or operating your vehicle for extended periods in the clutch slip/engagement zone, can overheat and damage the No. 1 clutch. By observing the driving guidelines outlined in the vehicle Owner’s Manual, drivers can avoid overheating the No. 1 clutch. A Clutch Improvement Kit is available which allows the No. 1 clutch to operate at a lower temperature, potentially preventing clutch damage under the conditions described above. Because your satisfaction with your Pioneer 1000 is important to us, if necessary, Honda will install the Clutch Improvement Kit free of charge for parts and labor. Potential No. 1 clutch overheating and damage will affect only a small percentage of the total eligible vehicles. Even without the Clutch Improvement Kit, most customers will have excellent vehicle performance if they observe the driving guidelines outlined in the vehicle Owner’s Manual. To ensure that your Pioneer 1000 continues to deliver satisfactory performance, please review the Driving Guidelines information on the reverse side of this notice. If you experience a slipping clutch problem, please schedule a product improvement appointment with an authorized Honda Pioneer dealer. Plan to leave your vehicle at the dealership for at least two days to allow for dealer scheduling. The dealer will inspect your vehicle for No. 1 clutch slipping/damage and, if necessary, install the Clutch Improvement Kit free of charge. Initially, improvement parts will be in limited supply, please check with your Honda dealer for the latest parts supply information. * This Product Improvement Campaign ends September 30, 2020 or at the end of the Honda SXS/MUV Limited Warranty period, whichever comes later. What to do if you feel this notice is in error: This notice was mailed to you according to the most current information we have available. If you no longer own this 2016-2017 Pioneer 1000 or some information in this notice is incorrect, please fill out and return the included, postage-paid Information Change Card. This will help us to update our records. We apologize for any inconvenience this may cause you. Thank you for your Pioneer purchase and your cooperation. The satisfactory performance of any vehicle depends upon the operator fully understanding the basic operation of the vehicle as well as its technical features. This is especially true for the Honda Pioneer 1000 series, which feature several modes of operation that will help deliver maximum performance, no matter what the terrain or task. As the vehicle owner, it is your responsibility that all operators review the Owner’s Manual prior to operating the vehicle, primarily to ensure driver and occupant safety, and to operate the vehicle within its design limits. The Pioneer 1000 features a Dual Clutch Transmission (DCT). As the name suggests, two clutches (No. 1 Clutch and No. 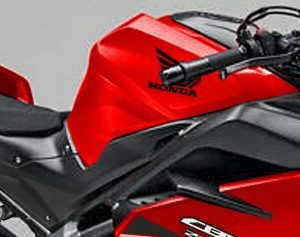 2 Clutch) enable both smooth take-off and smooth transition from one gear to the next. During take-off in both reverse and 1st gear, only the No. 1 clutch is utilized. During shifts from one gear to the next, both clutches are active. During take-off (the moment in time that the wheels transition from stationary to turning) the No.1 clutch momentarily slips before fully engaging. This is the clutch “friction zone.” To avoid overheating the No. 1 clutch, drivers should focus on minimizing time spent in the friction zone during take-off. When the throttle is applied, yet the wheels are not turning, the No.1 clutch is operating within the friction zone and is subject to overheating. Clutch overheating occurs when holding the vehicle on an incline with the throttle, or when the vehicle is stuck in mud and the wheels will not turn, or attempting to tow an immoveable object such as a tree stump. So what can the driver do? Use the brake to hold the vehicle on an incline. Get a tow when the vehicle is stuck in mud and the wheels will not turn. Do not try to tow an immovable object; use another method to accomplish the task. and there is frequent stop-and-go, shift the shift select lever into low-range (L) position. lever into low-range (L) position. the clutch will fully engage more quickly. As outlined in the Pioneer 1000 Owner’s Manual, these guidelines will help ensure satisfactory vehicle performance while towing, hill climbing, or in engaged in low-speed technical driving. High-range (H): Used when driving on hard surfaces, with light cargo, or at higher speeds. The added weight of carrying cargo or pulling a trailer will affect how your vehicle accelerates, brakes, and handles. The added weight and length of a trailer will affect your directional control. Do not exceed the cargo limit and towing limits (See the Owner’s Manual). When driving with heavy cargo or towing heavy loads, shift the shift select lever into low-range (L) position. Keep speed low, particularly when driving on hills. Select an appropriate drive mode for the hill. When ascending steep hills, shift the shift select lever into low-range (L) position. Approach the hill with enough speed to smoothly start up the hill. Maintain a steady speed as you climb the hill.